A booking photo, as well as one taken when John D. Williams was on the ground, generate some backlash on social media. Authorities addressed questions Tuesday surrounding the arrest of the man accused of killing a Somerset County sheriff’s corporal, saying that John D. Williams suffered a black eye while offering “limited resistance” during his apprehension Saturday and that a photo in which an officer is pulling Williams’ head up by the hair was taken to confirm his identity. The 29-year-old Madison man is charged with murder in the death of Sheriff’s Cpl. Eugene Cole. Police say Williams shot and killed Cole on April 25, then stole Cole’s police vehicle, ditched it on a road in Norridgewock and went on the run before he was caught four days later. 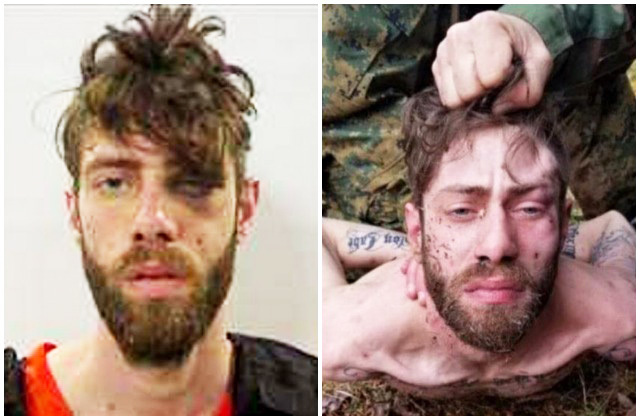 The photo taken moments after a team of seven officers arrested Williams in the woods of Fairfield on Saturday shows him shirtless and lying stomach-down on the ground with his hands handcuffed behind him. The photo shows a hand grasping his hair and lifting his head up to face the camera. On Saturday, after the photo appeared on social media and police confirmed they had taken it, authorities said Williams’ treatment was necessary because he resisted having his picture taken and police needed to confirm his identity. Maine State Police later posted the photo on their official Twitter and Instagram pages, receiving more than 500 likes and 60 comments on Twitter, and 1,390 likes and more than 100 comments on Instagram. The image also generated hundreds of comments as the subject of a letter to the editor in the Portland Press Herald. The letter, written by South Portland resident Irving Williams, who indicated that he is not related to John D. Williams, said the photo was not living up to the words of Cole’s wife, Sheryl Cole, who said Williams would be treated with “dignity and respect” if he surrendered. The FBI had widely circulated images of several tattoos that Williams had on his arms and body, many of which were visible when the shirtless Williams was found in the woods. Christine Koch, a Press Herald subscriber, thought the photo was sensational, but didn’t fault police for taking it or releasing it. Cole’s wife, in a letter read by police during a news conference an hour before Williams was caught, urged Williams to turn himself in and assured him he would be treated with dignity and respect – as her husband would have treated him. But a criminal justice expert who viewed the arrest photo said that the “dignity and respect” benchmark isn’t necessarily realistic when a suspect is accused of killing a police officer. Maria Haberfeld, a professor at John Jay College of Criminal Justice in New York and co-director of the NYPD Police Studies Program, said the photo seemed to reflect the emotions of the officers involved. Cole’s killing comes amid heightened tension nationwide over police-involved shootings, police accountability in such cases, and instances of officers being targeted and killed. Cole, 61, was a 13-year veteran of the Somerset County Sheriff’s Office, and his son David is a deputy there. A police affidavit filed Monday in support of the murder charge against Williams does not spell out a possible motive for the killing, instead suggesting through narrative details that it was a chance encounter in which Cole, who was on patrol in Norridgewock, came across Williams during the early morning hours on April 25. McCausland said Williams got the black eye seen in a booking photo as he was being arrested. “There was some limited resistance and he sustained the injury as he was being arrested, but I don’t have specifics,” McCausland said when asked how Williams got the black eye. He said Williams did not suffer any other injuries. Patrick Nickerson, Williams’ court-appointed attorney, declined to comment on the photo or its release, and said he’s still trying to determine whether his client was mistreated. However, a close viewing of the capture photo does reveal some discoloration on the left side of Williams’ face. Nickerson, asked whether he thought his client will get fair treatment, said that was a concern. On Monday, the case was ordered moved to Cumberland County, with Nickerson saying his client would be more likely to get a fair trial there – given all the media coverage of Cole’s murder in central Maine – even though the story has been prominently featured in Maine’s statewide media. “Practically speaking, in today’s digital age, I’m not sure there is a perfect venue to try this case,” Nickerson said. The capture photo was taken by a team of seven officers from the Maine State Police, the Maine Warden Service, the Fairfield Police Department and the FBI’s Boston office after Williams was found in the vicinity of 807 Norridgewock Road in Fairfield, ending a four-day manhunt. McCausland said the photo was necessary to send to the command center, which police had set up at the Norridgewock Fire Department, to confirm with officers there the identity of the suspect. Haberfeld, the John Jay College professor, said each police agency has standard operating procedures, but they are guidelines and are not set in stone. Several people on social media used the image as an opportunity to thank police for their work apprehending Williams and said law enforcement handled the situation correctly.